The costumes worn by the lawyers are the most distinctive working costumes in existence for more than seven centuries. The costumes for judges were more or less established by the time of Edward III (1327-1377) based on the dress code for attending the Royal court. The material for robes was originally given to judges as a grant from the Crown. The division of legal profession in England dates back to 1340, paving the way for the evolution of professional advocacy. In 1340, in a reaction other people opposed the length of the attire but the lawyers obstinately decided to adhere to the long robes. The medieval judges wore violet robes in the winter and green robes in the summer. The green summer robes fell into disguise by 1534 and after 1534 only the black and violet robes were commonly worn. However, robes can be interpreted to mean wig and gown. Apart from clergy and the military, legal professionals used to wear gown. In Europe as far as forensic dress is concerned, a scholastic and ecclesiastical tradition goes back to the days when long mantles were worn by the avocati-consistorial of papal courts and the lawyers of the Roman Sapienza. Reverend advocates in ecclesiastical and secular courts used to wear toga which subsequently came to be the pleader's uniform. Long robes were imported into the courts first by the priest- original judges and later by those who patronized the courts since 13th century. In ancient Rome a judge used to wear a purple-trimmed toga when performing his duties as a judge to derive their authority from monarchies or feudal lords. In England codification of rules for English judicial uniform occurred with the Judges' Rules of 1635 introducing no change rather set out what and when the existing costumes to be worn. After 1635 a black robe with a light colour fur in winter and violet or scarlet robes with short-pink taffeta in summer were introduced. A black girdle or cincture was worn with all robes. By the end of 1680s two rectangles of linen tied at the throat. So, in England judges, barristers and solicitors in the 17th century were using black coats, robes, traditional wigs and bands. Three stories are heard in England regarding using of robes. Firstly, robes adopted in 1685 as the symbol of mourning for King Charles II. Secondly, in 1694 it is found that all of the nations judges attended the funeral of Queen Mary II dressed in black robes as a sign of mourning. Thirdly, in memory of Queen Anne in 1714, the same mourning was followed. Italian judges resembling English judges in the 18th century wore white wigs, black robes and white bands. Thus from the tradition of three monarchs the black robes tradition spread around the Britain and then surrounded in the world and still persists today as part of the Britain's colonial adventures. The ancient Egyptians used to wear wigs to shield their shaved, hairless heads from the sun. After the fall of the Roman Empire, the use of wigs went into oblivion in the West for a thousand year until they were revived again in the 16th century as a means of compensating for hair loss or improving one's personal appearance. Royal patronage was crucial to the revival of the wig as Queen Elizabeth I of England famously wore a red wig in a Roman style while French Kings Louis XIII and Louis XIV pioneered wig-wearing. In 1624 Louis XIII went prematurely bald and the fashion conscious king in absence of his natural curly hair used to wear a wig to disguise his baldheadedness. His successive king Louis XIV also went prematurely bald and opted for wig as a style leader. Since then wigs were used as fashion which became almost universal for European upper & middle class men by the beginning of the 18th Century. Other rationales included ease of hairdressing, ease of cleaning of hair, comfort while sleeping, ability to change styles and colours and class considerations as wigs were expensive. Wigs were also used after shaving of natural hair to get relieve from head lice. Around 1715, lighter wigs were used as fashion too. It dribbled its custom out of fashion until the 1720's when it was only worn by professionals namely lawyers and doctors. After 1740, it was only worn by judges and had gone completely out of fashion. Bands are official neckwear accustomed to use by clergy and lawyers. Bands used by clergy often called preaching bands and worn by lawyers are usually called barrister's bands. Again the history of adoption of bands credited to England where bands were used for legal, official and ecclesiastical and academic use in the mid-seventeenth century. During mid-seventeenth century plain white bands came to be in variable neckwear of all judges, sergeants, barristers, students, clerical and academicians. However, the judicial costumes in the UK have been changed a lot in 2008 and 2011 stopping wearing of gowns and wigs in the Supreme court, civil and family courts. The USA also mirrored the British judicial costumes of the 18th century but after revolution wigs were banned retaining other robes. But by the mid-nineteenth century the USA almost quitted the British styled robes fixing no specific dress code for attorneys. Almost every judge in USA wears a black robe over formal business suit and attorneys are free to choose their own costumes. Australia and Africa have changed the dress code in court premises recently. Middle East countries tend to follow anti-western dress code in courts. In Afghanistan and in Iran chief justice wear white and black turbans along with traditional robes. Judges in Libya and Egypt simply wear green sashes over the business suits terming green as the colour of justice in Islam. The origin of legal profession in the Indian subcontinent is traceable to the English legal system due to their ruling for 190 years. Considering Britain as the mother of the judicial attire and addressing, judges and advocates in the courts in India use almost the same. 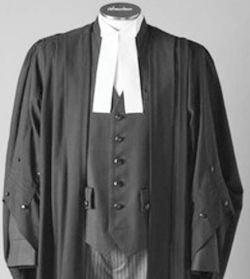 In India, as per rules under the Advocates Act, 1961 advocates shall have to wear a specific robes namely a vest, a white shirt, a black coat, a black gown and a white band with a slightly dressed down version for female lawyers. Instead of white band a black neck tie is used in the subordinate judiciary. Indian Bar council in 2001 relaxed wearing of black coat for advocates practicing in subordinate courts during summer. Again in 2006 India throws out the phrase “My Lordship” or “My Lord” addressing the judges of the Supreme Court and High courts and instead favours “Your Honour”, “Honourable Court” or just “Sir or Madam”. Pakistani judges and advocates also use black and white in the courts. In 1980s, Pakistani judges modified their dress code to do away with wig and to allow a black traditional Pakistani sherwani. As a staunch follower of the British judges and advocates Bangladesh still follow them. The Supreme Court of Bangladesh provided criminal rules and orders fixing dress code for judges and advocates. Regarding dress code there is no mention in the Bangladesh Legal Practitioners and Bar Council Order, 1972 other than their professional conduct and etiquette. Appellate Division Rules of 1988 of Bangladesh Supreme Court talk about senior advocates and advocate on records. Nothing has been changed in Bangladesh concerning dress code for lawyers and advocates. The writer is Faculty Member in the department of Law & Justice, Southeast University.